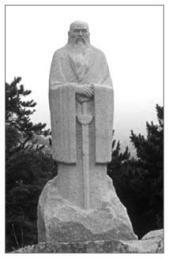 A Buddhist Priest of the Shaolin order named Wong Long (photo of his statue shown o n this page) created the Praying Mantis Kung Fu system more than 350 years ago. Legend has it that Wong Long was inspired when he saw a battle to the death between a cicada and a praying mantis. According to oral history Wong Long was amazed by the precise and effective fighting skills displayed by the mantis against its giant opponent. He captured the praying mantis and copied its movements. Later on Wong Long added footwork from Monkey Style and integrated select movements and techniques from as many as 17 additional kung fu styles. He continued to develop and perfect the art throughout his long life. Wong Long chose deciple Sing Sil to be his successor. Sing Sil’s successor was Lee San Chine. Lee San Chine passed the art along to Wong Wing Sang. Wong’s successor was Fang Yuk Toung. Toung passed the art down to Lo Kwang Yu. Low Kwang (1889-1944) relocated to Hong Kong where he taught 7-Star Praying Mantis kung fu at the Hong Kong branch of the Ching Mo Association. Low Kwan died in 1944 after a long and successful career but not before passing his knowledge down to Chiu Chi Man (1901-2002). In 1933, Master Chiu Chi Man was administered the position of Martial Art Supervisor for the Hong Kong Chin Woo Athletic Association and was honored by Grandmaster Low Kwang Yu to act as an Assistant Instructor to the Seven-Star Praying Mantis Style. Master Chiu was appointed to take over teaching the Kung Fu lessons during Grandmaster Low’s absence for his travels outside the country. Lee Kam Wing was born in Hong Kong in 1947 and began studying Praying Mantis Kung Fu at the age of 15. He is now the leading practitioner in Hong Kong. Under Master Chiu's guidance Lee Kam Wing inherited the complete system of Seven Star Praying Mantis Kung Fu, Herbal medicine and Bone Setting. In 1972 with the encouragement of Master Chiu, Master Lee opened his own martial arts gymnasium. Grandmaster Chiu has presented Sifu Lee with four hand written books detailing the complete system of Seven Star Praying Mantis Fist Forms, Weapons, Bone Setting and Chi Gung. These books had previously been given to Master Chiu by his Master Lo Kwang Yu.